Regardless of the economy, good medical practitioners will always be needed and wanted. Being a clinician is not only a noble profession, it can be a prosperous one. The nurse is an invaluable part of the medical process. They evaluate patients and plans. They’re responsible for implementing and documenting patient care, as well assisting physicians. They perform tests and administer medication. They are very important to the mental, not just physical, well being of the patient as they promote independence, aiding patients and families in understanding self-care and conditions. Becoming a nurse requires an Associate’s Degree and certification in the state of practice. It’s an extremely promising field. 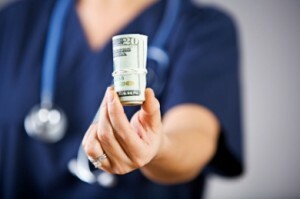 The median compensation package for a staff nurse in the United States is $66,178*. There are many areas of study that can lead to exceptional positions. It’s all a matter of specialized education and training that can be done after finishing nursing school. A Master’s Degree in Nursing, let alone a specialized study, can increase an average nurse’s salary immensely. Here are 10 highly regarded nursing positions that promise with the right education and experience to have the best compensation packages. Also called Chief Nursing Executive or Chief Nursing Officer. This is essentially an executive position and pretty much the highest business level that a nurse can achieve in any medical environment. It will require not just experience as a clinician, but a strong understanding of management, overseeing personnel and setting policy, all with a firm handle on how these decisions can affect a medical environment. That’s why the position will require well over 10 years of experience and a Master’s. An MBA would be even more impressive. Any hospital or large medical facility with a nursing staff is likely going to need a Head of Nursing. The median salary for this position will be in the $179,000* vicinity. These clinicians work with anesthesiologists, surgeons, podiatrists and dentists. It requires an extensive amount of education and training. Outside of a four year science or nursing degree and a Master’s, there will be at least one year of experience as a licensed registered nurse in an acute care setting. There will also be an additional two years of study in an anesthesia program, followed by a certification exam. Of course, the administering of anesthesia is an all important and critical aspect of medicine and requires the strictest of standards. These nurses are utilized wherever anesthesia is used: hospital, dental offices, surgical suites or plastic surgery centers. The average salary is in the range of $135,000* and $147,000* annually. The position of Chief Nurse Anesthetist can bump that up anywhere between $10,000 and $20,000. A Nursing Director is responsible for any and all aspects of the medical department’s nursing staff. They oversee budgets and schedules and set policy. It will not require only nursing experience. The Nursing Director will have to demonstrate exceptional skills with project management, people skills and leadership. They also serve as the strongest liaison between hospital administrators and staff. A specialized, advanced degree in Nursing is definitely a plus. Again, any facility that has a nursing staff could have a Nursing Director. Once achieved, look for this position to pay around $110,000* a year. Nursing Researchers are actually scientists. It’s a structured, independent, behind the scenes position where research is conducted towards improvements in the field of nursing. They work private, government and individually funded projects. They write grants and manage databases. They compile, analyze and design scientific information, reporting the results accordingly. These results can have a dramatic and direct impact on the medical profession and its patients. The position will require a Master’s of Science in Nursing. A PhD in the Philosophy in Nursing may be needed for specified areas of research. A Nurse Researcher is looking at a roughly $95,000* salary. This will need a Master’s and a qualified certification depending on the region. A registered nurse program followed by a midwifery program will be required. In a given year, certified nurse midwives will attend somewhere in the vicinity of 300,000 births. The setting can range anywhere from a hospital to private residences. These midwives also offer a wide array of medical services. This includes gynecological exams, family-planning education and pre- and post-natal care. If on hospital staff, Certified Nurse Midwives will work closely with OB/GYNs. These nurses can earn an annual salary upwards of $90,000*. The responsibilities of a Clinical Nurse Specialist falls into three primary categories: system and network organization, patient and family planning, and nursing personnel and practice processes. While these clinicians may still be responsible for diagnosing and treating patients, as well as other nursing duties, they will also have scholarly responsibilities: number crunching and the evaluation of information, helping to assess procedures and personnel. The national average for this position is $90,000*. If any medical facility has at least two nurses, it’s likely there’s a Head Nurse. Not to be confused with Head of Nursing, this position requires a completely different set of criteria and experience. This registered nursing spot asks for only a minimum of five years direct experience in a medical environment like obstetrics, ICU, OR, ER or CCU. While nurses may be responsible for their patient records, the Head Nurse will oversee all records and nurse performances. The Head Nurse will take charge of inventory levels and any daily duties for the nursing department. In return, they will receive upwards of $87,000*. This specialized profession requires a Master’s degree and certification in a specialized area. The majority of states stipulate that nurse practitioners operate in collaboration with physicians. A number of other states require Nurse Practitioners to operate under the supervision of a physician. On the other hand, there are at least a dozen states that allow these specialized nurses to open their own clinics. Varying state to state, they can diagnose and treat injuries, acute illnesses and infections. They are allowed to provide a range of medical services. The salary can start at $83,000*. It can go up in specific environments, such as ER and pediatrics. Endocrine diseases include diabetes, thyroid cancer and osteoporosis, to name a few. A Pediatric Endocrinology Nurse works with children suffering from these ailments. They work with pediatricians to develop treatment plans and care for infants to teens suffering from delayed growth and development, and adrenal and pituitary problems, among others. While an Associate’s and Bachelor’s will be needed, courses in endocrinology and pediatrics are a must, as well as experience in pediatrics, diabetes and internal medicine. These positions can start at $81,000*. This is a multifaceted and well defined nursing position. An Orthopedic Nurse works with patients suffering from musculoskeletal disorders and diseases. This can include arthritis, joint replacements, fractures, genetic malformations, broken bones and osteoporosis. They can be involved in both surgery and recovery. They also educate patients and families about musculoskeletal prevention, symptoms and treatments. This position will need at least two years registered nursing experience, as well as Associate and Bachelor’s degrees, the passing of both a licensure examination and orthopedic nursing certification exam. At the end of the line, these medical professionals can look forward to earning an annual salary of $81,000*.